The award winning GPS-adventure app and trail-guide publishing platform ViewRanger has today launched a major update of its Android app, which is available free from Google Play. 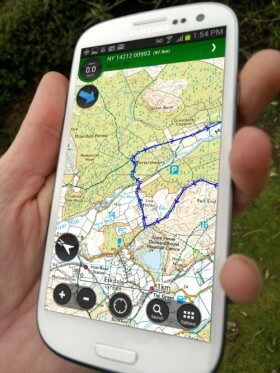 The new user experience within Version 4.0 of ViewRanger Outdoors GPS means that the app’s key features – advanced active navigation, access to trail guides from across the world and the ability to record and share location-based adventure content online – are now just a finger-swipe away. Over the last 14 months, the company has gathered feedback from its global user community who range from occasional walkers through to cycling enthusiasts and mountain rescue teams. The result is an app completely re-designed and optimised for use on-the-go. For example, V4.0 allows advanced users to set up their own gesture-based shortcuts – particularly useful for cold nights or simply when cycling with a phone mounted on the forearm or handlebars. Building on its trusted reputation for outdoors navigation, ViewRanger V4.0 brings outdoor pursuits and social sharing closer together. It is now easier to access new content from the hundreds of branded publishers which use the ViewRanger platform and simpler for individuals to record and share their own adventures. This includes media integration with services such as Twitter and Flickr. ViewRanger has become the map and navigation app of choice for many search and rescue teams and even several explorers. The app’s companion website MyViewranger.com is already an established social media platform for outdoor enthusiasts. It allows route plotting, recorded GPS track analysis and map printing from a larger desktop screen. This update makes it easier to synch route guides and recorded GPS tracks between the ViewRanger app and the MyViewranger website, but it also builds further on these capabilities, allowing users to view, comment and ‘like’ the adventures of friends via the app. The ViewRanger app surpassed one million installs at the end of 2012 and it is increasingly recognised as an innovative platform for all those who participate in, or contribute to, outdoors recreational activities. Its network of content publishing partners includes national agency or premium cartographic publishers in over 22 countries. Trail guide publishers include guidebook authors, tourism organisations, consumer magazines, cycling holiday organizers and hotels. The latest version of the app is free to download from Google Play immediately and comes with all of its functionality as well as free access to open source mapping and thousands of free trail guides. Once installed users are then able to purchase premium content such as topographical mapping and premium trail guides. Speed or distance viewable whilst on the map. All-new trip view for recording tracks, with further configurable trip statistics accessible by swiping from right of screen. ViewRanger V4.0 will be available for Apple iPhone and iPad shortly. ViewRanger is the app for adventure – how outdoor enthusiasts worldwide discover, create, navigate and share their outdoor adventures on smartphones, on tablets, and online. Used by active outdoor consumers, ViewRanger is also trusted by search & rescue teams and other outdoor professionals. ViewRanger combines an advanced location-based navigation and guidebook app with an interest-based social network and an open digital trail guide marketplace. ViewRanger is free to download and fully functional with global mapping that can be stored offline and thousands of free trail guides available. Additionally highly detailed topographic mapping sourced from national mapping agencies and premium publishers from most European countries,USA, Canada and New Zealand can be purchased in-app. 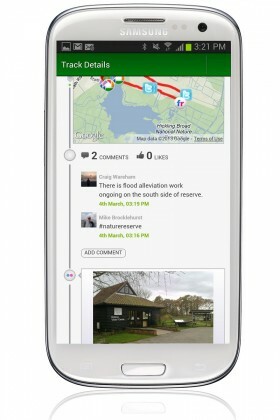 The global community of ViewRanger users store and share their adventures using the app and the web based tools at www.my.viewranger.com. Over 400 official bodies, such as tourist agencies, book publishers, hotels and magazines also use the service to digitally deliver their expert trails for walking and cycling to smartphones. ViewRanger pioneered the concept of outdoor gps navigation on smartphones - going back to the delivery of the company’s first “app” in Spring 2006. ViewRanger has achieved Number 1 Best-Selling app status (across all categories) on Apple iPhone and #1 app within its category on iTunes appstore in more than twenty countries. The app has also achieved multiple #1 rankings on Google Play and Nokia OVI app stores.